after only a few good nights since November, I could say that this winter is really terrible for hobby astronomers in Germany. Yesterday it was my sixth night under clear sky. The temperatures and the cold wind do not just stop. The forecast say, that the sky should be covered by the end of next week and so, this Jupiter is probably the last for me in this season. In a few weeks he is already too low on the horizon. Then Saturn is the object of the night. I used my 115/805 TMB Apo (No. 83) and enlarged from 130x to 200x. Towards the end I could even observe the gas-giant with the 3.5 mm eyepiece (230x). The air was very quiet and many fine details were visible. I hope you enjoy the sketch of our biggest neighbour in solar-system. It was a great feeling, to catch all these particulars. Location: near Tauberbischofsheim (Germany) 335m above sea level. 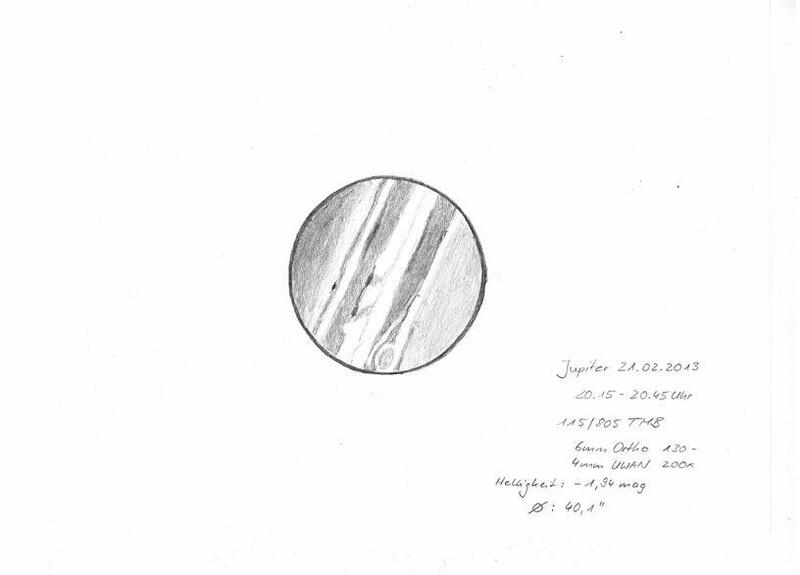 That is a very well done, detailed drawing of Jupiter. Fine capture of Jupiter and great detail across the entire orb.